“The AKP and Gulen congregation, two forces that turn Turkey into political and social coexistence and continued together with the support of partisans, so-called powerhouse, sewage exploded. The two forces that built the so-called ‘New Turkey’, a Machiavellian understanding that is appropriate to apply any kind of rush to achieve it, AKP and Gulen Congregation split. Both do not want the democratization of the system and society, they are the foci of power that seeking to conquer the state, they are trying to organize it by making their authority predominant. These two foci, with an understanding of trying to make the commitment to the authority of the state, which they think they will be the only power to speak in the long run, have accumulated material for destroying each other while fighting common enemies on the other hand. The closeness of the day that these materials could be used was apparent from the fact that the stench in the drainage was spreading out over for a long period of time. Threats from media columns, underhanded liquidations, occasionally leaked phone calls, and police-judicial operations based on illegality were the signs that they would be targeted at the constituents of the government after common enemies. When they were convinced that there were no enemies to be destroyed, they were aiming at each other by holding onto the fight that the state’s owner would be. Yes, it was a mess and still it is a mess. Apparently it will be like this for a while. In this battle where ethics and religion are used, the lies that meet the needs of the parties are more prevalent than the truths. So, do not be fooled by the defences made by them. This war is not for democracy and clean society, nor for peace or civilization as somebody claimed. They just fight for being the owner of the state. After these lines were published, the war between the AKP and the Gülen congregation worsened. The period of a false history writing process, which started with the Ergenekon investigations in 2007, who took more share on the plundering of the state and the country by the ruling and crime partners, extended to a coup attempt. On 15th July 2016, 250 people were killed in a bloody upheaval. There is serious doubt that this attempt, which we are forced to believe is the sole responsibility of the Gülen Community, was already known by the government. Despite the fact that over a year has passed and numerous investigations have been launched, suspicions have increased rather than decreased. The July 15 coup d’état, which is required to remain in the dark with many signs, which led us to believe that the needed ‘Controlled Chaos’ was being yielded, was the most important milestone of the fake historiography that spanned the last 10 years. The only truth of this fakeness which has been constructed with the words “democratization-civilization” and lies, is the people slaughtered by the coup plotters. It is worth to ask questions about what is wanted to be left in the dark and saying “Controlled Chaos” to this situation. Recep Tayyip Erdogan, who is the target of the coup attempt, has spilled the beans by expressing his intention while the country was in the middle of a bloodshed, and said “This coup is a blessing from God to us”. We have seen what ‘blessing’ means and have witnessed it together and are still witnessing it. We pass through the dark and increasingly darker days, where those who voiced the truth, those who objected to the crime order, those who demanded their usurped rights, are the voices being muted and strangled. The Coup was stopped but, all basic rights and freedoms were suspended by the State of Emergency (OHAL). Tens of thousands of people have been detained on charges of ‘Supporting Coup-FETO’, more than 50,000.00 arrested. Some people have been tortured. With Executive Orders, the state and the society have been speeded up in the design of Turkish-Islamic form. By the practices that justify their suspicions that the distinction between “’those who are with us’ and ‘those who are not’” are considered as the only criteria, more than 110,000.00 public officials were purged. The gap created in the public sector, especially the basic organs of the state, such as security, judiciary and education, was filled with AKP staff based on allegiance, not capability. The scientists who educated students for years, teachers, have been left unemployed by ruling that they are “terrorists”. Even the response to the hunger strike of the struggle to get back their rights, was prison. The way of the regulations, to officially abolish the principle of separation of forces, which had actually been removed from the scene, was opened under a controversial referendum in the conditions of State of Emergency (OHAL), without ballot-box security. Judicial independence and neutrality, which are always troubled in Turkey and tried to prove their existence with exceptional examples, were completely hidden away by the judges and prosecutors who appointed themselves to the interests of the government. The violation of the freedom which seized by arresting terror, has been extended to Parliament’s third-largest party which represents the will of the 6 million voters. HDP’s co-chairs, deputies and several mayors who were elected by the polls were also captured. And even, the main opposition party, the CHP, endorsed the legal regulation which will open the way for these arrests, by the fearing of “CHP protects the terrorists” propaganda; and these arrests extended to a deputy of the CHP. Many non- governmental organizations (NGO) were closed. Those who defended rights have been arrested. Many companies have been seized. Several media organizations including the press and have visual and audial broadcasts have been shut down in a country which is proud to have achieved a great democracy after stopping the coup. Aside from a few media organizations and journalists who are still trying to resist even against threats resist of Investigations, lawsuits, and arrests along with economical pressures there are not many remaining who are trying to uncover the truth. After imprisoning 150 journalists, Turkey has obtained the title of “the world’s largest journalist prison.” So much so that, Turkey, alone, has more incarcerated journalists than the entire number of journalists in prison all over the world. If we add the journalists who are not in prison but are still “under arrest” through censorship and auto- censorship to the list, the picture we paint is even more pessimistic. Because of the dark shadow of censorship even though there exists many media organizations under the ownership of private investment groups, a single-voiced news broadcasting has taken over the country. On the tv channels which must do live broadcasts, even if President Erdoğan talks in his sleep, they cannot broadcast any political programs without permission of government commissioners. When the media is in this state, the only platform remaining for political criticism is social media. As long as the access is not blocked, as long as the internet is not cut off due to government censorship, and as long as you have not written anything to offend AKP’s internet trolls and informant citizens and prosecutors, then there are no barriers for you to use your right to criticise. However, there is no guarantee that you will not be arrested for using this right. This is the summary of the current pessimistic state of the country on the aftermath of a failed coup. Actually, it is easy to summarize all of this in one sentence: On July 15th a coup was diverted but the junta came to power. When we look at the period since the bloody attempt, that is seen as a favor, and the picture we have described, who could say that these goals were not achieved? Did the takeover of executive, legislative, and judicial branches The Government of the Turkish Republic not occur? ​Using the state of emergency (OHAL) and law- amending ordinances (KHK), are they not trying to design the government and society according to their own ideologies and interests? Are they not using a coterie hand with oligarchical traits to control the economical, societal, and political power in their determination to pillage the government’s and country’s resources? This is the reason that the biggest defeat of the Gülen congregation (Cemaat) that is The July 15th coup attempt, is also their biggest victory. Because, the model Fetullah Gülen idealised for the government, society, and individuals, was put into motion after the July 15 coup attempt. The patent of this system, construction of which is moving along rapidly and which is one that all who side with democracy should oppose, belings to Fetullah Gulen, even if the system might be in someone else’s hands. Thus is exactly the reason why Recep Tayyip Erdoğan and the AKP government gave Fethullah Gulen and his congregation everything they wanted. Now, they act as if they had nothing to do with the transformation of the Gulen congregation, who were undeniably one of the parties involved in the bloody coup attempt, into a monster referred to as FETO. They want us to keep silent about their guilt and to not tell the truth. They are using the blood of the victims killed by the putschists as a demagogic part of a cheap and shallow political strategy. Because, those who hold power in their hands have only one goal in mind: to continue their totalitarian rule no matter what. And for this, they will do very bad things and they will have a mindset where anyone is dispensable. Journies of long term sovereignties have histories which include many examples of ending relationships with your initial travel mates. They leave those who no longer serve a purpose and are no longer needed, behind. They disposed of their supporters, accomplices, co-conspirators, and even their comrades. Undoubtedly, the ones who remain and the new ones who have been added will also get their turns. The Gulen Congregation, which has a history of 45 years, completed its horizontal organization within the state in the first 30 years, finalizing its vertical growth in the last 15 years. No obstacles were left for its crafting the state parallel to itself by utilizing the opportunities provided to it by the AKP government to whose power it became a non-official partner. The congregation accumulated enormous power within the police and judicial organizations and the operational units of the military. It was not difficult for it to ensconce itself in strategic positions by using the AKP government. Subsequently, they were successful in establishing a domain of influence to impose their priorities, by eliminating the people or institutions in the governmental and civil domains, which may have become an alternative option or a possible rival. To state the truth, Recep Tayyip Erdogan, who confessed to his crime by stating “What did we not give that they asked for” and “apologized for the help he gave to them” and AKP which has been in power in the last 15 years, is the most responsible for the Gulen congregation to secure its power in the government and society, thus, rendering them dangerous. I will explain this with a few examples; however, it will be useful to call your attention to a point first. A large number of officers, who were not members of the Gulen Congregation, were purged from the Turkish military by staging several trials such as Ergenekon, Balyoz, Military Espionage and several other investigations. The ones, who were not imprisoned, were not promoted by using cruel defamation tactics. Erdogan, who was the prime minister at the time, had announced that he was the prosecutor of these lawsuits. AKP government had shielded the plotters from the criticisms and accusations directed to them, while also acting as an accomplice since it was the political authority. However, now, they are trying to put the burden of all these crimes and sins on the Gulen Congregation and to hide their role and crimes in these events. At the time, there were a lot of people who were imprisoned due to the conspiratorial plots of the congregation or were subjected to public defamation by the hatchet men of the AKP-Congregation partnership in the media. We should not neglect to mention that some of these people, among whom there were journalists, acted as the facilitators/partners in hiding the crimes of AKP and even were on stage as the executors of defamation tactics during that period. If we go back to what we were discussing, Gulen Congregation opened the path for their members into the Turkish Military by shaping the promotion list and order according to their benefits and goals by exploiting the conspired trials mentioned above. The officers in the Turkish Military, who were not members of the Congregation, were not limited to the ones prosecuted by these trials. AKP government ran to the help of the Congregation to eliminate the remaining ones. The compulsory service period for the military personnel was reduced from 15 to 10 years according to a change in the code realized in May 2012. Congregation was calculating that some of the officers not on their side may retire from the military. And they were right. Several officers resigned because of the climate of apprehension generated by the plotted trials and the loss of dignity suffered by the Turkish Military. Interestingly, some important regulations were achieved after this first legal change, even after the battle between the AKP and the Congregation has begun. The investigations on the corruption charges on December 17/25 2013 were the culprit in the transformation of the battle between the AKP and Congregation into a big war, and severing their relationship beyond repair. The MİT trailer operation where weapon and ammunition aid was provided to the Salafi jihadist groups fighting against the regime during the Syrian civil war. During the period when the relationship was broken off, some regulations related to the military were realized in the Parliament according to changes in the law based on the demand, proposal, and votes of some members of the parliament from AKP. Firstly, AKP with its majority in the Parliament adopted a regulation on February 11, 2014, which brought the promotions in the Turkish Military forward by one year. Thus, the colonels of four-year service and generals of three-year service who are members of the congregation were included in the Supreme Military Council (YAS). The officers who were not members of the congregation and did not get promotion due to the decision taken by the YAS would, thus, be retired and purged from the Turkish Military. The second change was realized two months later. According to the Turkish Military Supreme Disciplinary Board Regulations, that went into effect on April 12, 2014, new Supreme Disciplinary Boards were established with the goal of investigating the purges from the military. The amendment to the Officer’s Personnel Record Code, which outlines the working guidelines of these boards, was eliminating the purges from the Turkish Military due to reactionary religious activities. Another amendment was proposed to the Parliamentary Speaker’s Office on December 30, 2015 by 37 AKP members of the parliament. This amendment was decreasing the waiting period for the promotion from rank of colonel to general to four years. Thus, the promotion of the colonels who did not qualify for promotion, but were members of the Congregation, to the rank of general was enabled. The last change resulted in a code established to make amendments to the Turkish Military Personnel Code article number 6722 and some other codes. In 1988 and the years before that, the officers who graduated from the Military Academy made up a group where the influence of the Gulen Congregation was the weakest. The amendment mentioned above foresaw some arrangements which will reduce the service in the military to 28 years. Thus, the Congregation will have the power to purge the officers, which constituted the largest group of officers with no connection to the Congregation, from the Turkish Military en masse. This amendment was prepared by the generals Mehmet Disli and Mehmet Partigoc, who are suggested to be the most prominent actors of the July 15 coup attempt; and it was projected to become effective, except one article, as soon as it was adopted. The article that was projected to go into effect after the August 2016 Council meeting is the one on the en masse purge of the group of officers, who graduated in 1988 and before and among whom the Congregation was the least organized. By the resolution presented by the AKP group on June 23, 2016 during the discussion of the proposal in the Parliament, it was ensured that the said amendment will become effective as soon as it is adopted. The purges that the Gulen Congregation had targeted in the Turkish Military were realized by the staged trials put into action through the support of the AKP government and by the amendments realized in several codes by the government. The picture that emerged after July 15th demonstrates the significance of all these events. According to the report, almost all of the generals promoted after YAS decisions in 2011, 2012, and 2013 are now accused of being members of FETO. Same accusations have been addressed to the 80 percent of soldiers who were promoted from colonel to general with 2014 and 2015 YAS decisions, which were made following the legal amendments and changes made by the AKP government that I mentioned earlier. By the way, it should be emphasized that a total of 400 personnel were purged from the Turkish Armed Forces (TAF) between 1985 and 2003, the time when AKP came to power, based on the claim that they were members of the Gülen movement; but that there were no purging from 2003 until when the coup attempt took place. I will close this section in which I have tried to explain AKP government’s undeniable contributions to the strengthening of the Gulen Movement within the TAF to such an extent that they made a coup attempt. But before, let me also talk about the National Security Board (NSC) decisions made in 2004 but not put into effect. When the MGK meeting was held on August 25, 2004, the AKP was about to fill its second year in power. As you know, the NSC is a meeting where the highest-level military and civilian officials come together, discuss national security issues, and make advisory decisions. Its decisions are kept strictly confidential. However, the 2004 NSC rulings have been known for several years. They hit the headlines of the Taraf newspaper, which is well-known for its contributions made to the construction of today’s Turkey, on 28 November 2013. We learned the decisions of the NSC meeting through this headline, which was a sign that the conflicts between AKP and the Movement will become even more intense. The topic of this NSC meeting, which was held 12 years before the 15 July coup attempt, pointed to the danger that the Gülen Movement would create in the future. For this reason, at the meeting, an advisory decision suggesting to prepare an action plan against the Movement with the title «Measures to be Taken Against the Activities of Fethullah Gülen Group» was made and reported to the AKP government. The signatures under the decision belonged to the then President Ahmet Necdet Sezer, Prime Minister Recep Tayyip Erdogan, Foreign Minister Abdullah Gul and five other ministers, as well as Commander of Turkish Armed Forces Hilmi Özkök and other military members of the NSC: Aytac Yalman, Özden Örnek, Ibrahim Fırtına and Şener Eruygur. TAF, which was the owner of the proposal, recommended radical measures to be taken against the threats that the Gulen movement could create in the future, by closely monitoring the activities of the Gülen community, both within and outside the country. Let’s continue by reminding that three of the commanders who signed this decision were arrested through the scandalous cases, as well as what the government did during this period. It is also important that Arinc emphasizes the National Security Politics Document in his statement. National Security Politics Document defines the groups that the government has designated as internal and external threats. The Gülen Movement was also considered as an internal threat group in this document until 2010. However, as Arinc emphasized, the Gülen Movement was removed from the threat list by the AKP government itself. This is how Mr. Öneş, who was a senior manager at NIA, pointed out the AKP government as one of the major actors responsible for the occupation of the state by a religious organization. There are also statements that the AKP government has made regarding the issue and are criminal confessions. No, you have not been deceived. On the contrary, you tried to fool us together. I would also like to address that, although we have been saying this for years, the judiciary of Turkey is entering into a futile effort such as presenting the Cumhuriyet newspaper as a (terrorist) organization and us as FETOists, while it did not open any investigations about the suspects and found their explanation «we were deceived» sufficient. Let’s look at how AKP handed the judiciary over the Gulen Congregation. I will again quote from the report prepared by CHP about the 15th July coup attempt. After the coup attempt, several thousands of judges-prosecutors were expelled from the judiciary, in which the Gulen Congregation had considerable importance, on the grounds that they were «members of FETÖ». Many of them were arrested. CHP’s report includes striking findings about the staffing of judiciary members who are now purged. The report states that ​among the members of the judiciary who were purged with Executive Orders after the coup, the oldest member of the judiciary entered the profession in 1980. Since 1980 until 2002, the year AKP came to power, a total of 7,672 judges and prosecutors were appointed by different governments. Of these, the number of people who were purged after the coup attempt was 1,210. Proportionally speaking, among the members of the judiciary, which came to the office within the last 23 years, the percentage of those who have been purged given the allegation of having a connection with the FETÖ is about 16 percent. Let us now look at the period after AKP came to power. The report defines the years between 2003 and 2010 as​ the first AKP period. In this period, 3,637 judges-prosecutors were appointed and 1,255 of them got purged. In a proportional statement, the share of those who were purged in total assignments is about 35 percent. The ministers of justice of this period were Cemil Cicek, Mehmet Ali Sahin and Sadullah Ergin. The report examines the period between the 2010 Constitutional Referendum, in which demagogy of bringing the tutelage within the judiciary to an end was undertaken, and 17/25 December 2013, ​when the corruption investigations against the AKP were held, as the second AKP period. The ministers of justice in this period were Sadullah Ergin and Bekir Bozdag. Among the 2, 876 judges/prosecutors, who were appointed in the period of these two ministers, 1,192 appeared in the lists of expulsion. The share of expulsions in total assignments is about 42 percent. The report elaborates the period after the end of the AKP’s partnership with the Congregation, that is from 2014 until the July 15, 2016 coup, as the third AKP period. The Minister of Justice was Bekir Bozdag. Due to the intensification of the AKP-Congregation war, there was a certain level of decrease in the share of congregation in the judicial appointments in this period. Among the appointed 2,281 judges-prosecutors, 582 were purged. That’s about 26 percent. If we give the total numbers for these three periods of the AKP by comparison, in the 23 years between 1980 and 2002, the Congregation’s staff within jurisdiction was about 16 percent, while in the 14 years between 2003-2016 when the AKP government was in power uninterruptedly, it was 35 percent. In these 14 years, 3,029 of the 8,794 judges-prosecutors appointed by the AKP have been purged. Proportionally speaking, the proportion of members of the judiciary that were purged due to the connections to the FETO in total assignments was 35 percent. Even the export ratios for the period after December 17/25, 2013, which the AKP government has adopted as a milestone in investigations against FETO just to exempt its own government from the crime with a shallow cunning, are above the average of the period between 1980 and 2002. Let us finalize this issue by opening a parenthesis with regard to Bekir Bozdağ, who was the Minister of Justice until last week. Bekir Bozdag is one of the main people responsible of handing the judiciary over the Congregation. However, while we were imprisoned by the accusation of being connected to FETO, Bekir Bozdag ruled the purge of the members of the judiciary appointed by him as the head of the Judges and Prosecutors’ Board in the capacity of Minister of Justice, until the last week when his task was decided to be changed. Let’s also look at the situation within the National Intelligence Organization (MIT) where Hakan Fidan is the undersecretary, who received information about the 15th July coup hours ago but still could/did not prevent the bloody attempt. One of the names that gave testimony to the Parliamentary Investigation Commission on July 15th Coup was the former MIT Undersecretary, Emre Taner. The former undersecretary Taner, who clearly accused Hakan Fidan of the Congregation’s infiltration in MIT, thinks that MIT is the «cleanest organization» with regard to FETO. Let’s see whether there is any truth in it. MIT Undersecretary Hakan Fidan, who did not even go to the Parliamentary Investigation Commission on the July 15th Coup to give his testimony or was not allowed to do so, on request, sent a report on the MIT staff connected to FETO. Journalist Müyesser Yildiz, my «old organization friend» with whom I was arrested and confined through the Congregation’s caliber on the basis of the lie that we were members of Ergenekon, explained the content of this report on the news portal named Oda TV. According to MIT report, within 2,5 years since December 17, 2013 until July 15, 2016, action was taken against 181 personnel and after the coup against 377 personnel. In other words, a total of 558 personnel with FETO connections have been identified in the institution, which is claimed to be «clean». 167 of them have been removed from public service. As a result of the termination of the contract or resignation, the association of 70 has been cut off. The temporary assignment of 272 Turkish Armed Forces/Police personnel have also been terminated. In total, 509 MIT personnel were cut off from the organization, while the rest of the 49 personnel were undergoing various actions, while 5 were reinstated. There is no information on how many of the 558 personnel mentioned were appointed to MIT by the undersecretary Hakan Fidan since 2010. However, let me recall once again that the former undersecretary, Emre Taner, has accused his successor undersecretary Hakan Fidan about the Congregation’s infiltration to MIT. It is not only the former undersecretary who voiced his accusations or skeptics about Hakan Fidan. Prime Minister Binali Yıldırım is one of those who voiced their suspicions. Today, we all know that from the statement made by the informant Major O.K. in the investigation by the Chief Public Prosecutor of Ankara, on 15 July 2016 at 14:00 he went to MIT and notify them that there would be a coup. However, MIT Undersecretary Hakan Fidan continues to insist that the notification was not a coup attempt. Chief of General Staff Hulusi Akar also gave a statement confirming Hakan Fidan, saying that the Undersecretary had come to the headquarters and mentioned an air operation on MIT and a plan for his abduction. General Akar, although he said, «We thought it was part of a bigger plan», the tanks were on the streets about 7 hours after the notice to MIT. The war jets bombed the Parliament. Although the coup attempt was unsuccessful, 250 people were massacred. Because, it was not realized that military operation to MIT by using attack helicopters and the abduction plan of Undersecretary Hakan Fidan were parts of the coup attempt. Or that’s what they want us to believe. Now we are in the prison for telling these things, our doubts, and writing them. But those who admit that they do not have a capacity to understand that it was part of a coup attempt, continues to direct the army and the MIT. We know that no one could reach Hakan Fidan for a few hours after the coup attempt had begun. Moreover, it is still an unknown why undersecretary Fidan informed neither Prime Minister Binali Yildirim nor the President Erdoğan, who calls Fidan as «My Secret Cube», about the coup attempt. On 2 August 2016 night, the Prime Minister Binali Yildirim, who was a guest of the joint live broadcast of CNNTurk and Kanal-D television channels,: “I asked to MIT Undersecretary why he had not told me. How come the Prime Minister, the President did not know?”. I said, ‘It is natural to say to the Chief of General Staff, but also you needed to tell the Prime Minister.’ “He could not answer.” In other words, the Prime Minister underlined the fact that MIT’s weakness was not only the lack of intelligence on the coup attempt. In an interview with Prime Minister Yildirim, a year after the coup attempt, he squeezed an information between the lines which raises our doubts. Prime Minister Yıldırım’s interview with Fikret Bila was published in the Hürriyet newspaper’s «15 July Anniversary» edition. Yıldırım explains that he reached the conclusion after making phone calls to Istanbul and Ankara police headquarters that they were confronted with a coup attempt on July 15. He states that he was able get a hold of MIT Undersecretary Fidan 2 hours after the attempt started at around 22.30 – 23.00. Yıldırım says: «Information was not passed on to us, neither to me nor to the President. The Undersecretary (Hakan Fidan) did not say anything at that time. He did not say anything about the coup. I asked to him, ‘There is a coup attempt, what are you doing?’ . He told me: ‘ No, there is nothing, it is normal. We are working.’ «There is something different». Let’s recall what was happening at that time when MIT Undersecretary Hakan Fidan explained Prime Minister Yıldırım as «There is nothing, it is normal». At 21:00: The coup plotters captured the headquarters of the General Staff and the commanders. As they began to clash with those who resisted, gunfire began to be heard. At 22:00: Guns were heard at the headquarters of the General Staff and the helicopter opened fire on those outside. At 22:05 am: Although Chief of the General Staff did not allow to fly, war jets in Ankara have begun flying over the sound wall. Time 22:28: In Istanbul, the tanks closed the Bosphorus Bridges. At 22:35: Istanbul Atatürk and Sabiha Gökçen Airports were occupied by coup plotters. All these developments were first announced by social media and soon afterwards by national television channels. Let’s also mention, shortly after the hours that Prime Minister Yıldırım said he spoke with Undersecretary Fidan, at 23:00, the headquarters of MIT in Yenimahalle, Ankara, was attacked by attack helicopters. But Hakan Fidan said to the Prime Minister that «There is nothing, it is normal». As the Prime Minister stated «That business is different » indeed. And we will continue to look for the answer to the question of that ‘different business’ since, everyone has the right to know the facts especially the bereaved parents of those who put their lives in the line to prevent the coup. There is no doubt that, one of the stronghold of Gulen congregation within the state, is the Police Department. The major proof to this statement would be the different roles of the cops who are also members of the congregation in Ergenekon, Balyoz, Devrimci Karargah, KCK, Şike, Oda TV and similar conspiracy investigations and claims. After July 15th, more than 13 thousand police officers were removed from their positions due to the alleged connection to FETÖ. The vast majority of were arrested. However, we need to indicate that the number of the officers who are the member of the congregation is much more than that. The restructuring process of the Congregation’s organization in the police force has started in the 1980s. Therefore, AKP is not the only party who is responsible for this movement. Nevertheless, condonation of the AKP government of the cheating activities of the police force candidates in their exams or leaking the questions to Gulen’s teaching institutions before the exams, or ignoring the criticisms made them the sole responsible. – The questions of the police officer exam, that was performed in August 26, 2007 and more than 71 thousand candidates all around Turkey have participated in, were appeared to be stolen before. After the topic took media’s attention it’s been claimed that it’s been cheated in the exam and the questions were leaked to the groups implying the Congregation. The Interior Minister of the period, Besir Atalay claimed that knowing the exam questions in advance or the leakage of the questions is not likely to happen. – ​8 months later, Besir Atalay’s ambitious statement was proven unsound. The Vocational Police School exam questions were leaked to the FEM training centers that are owned by the Congregation and serviced to some of the students with the answer key in September 13th, 2009. The exam, that more than 60 thousand candidates have participated, was cancelled when the subject was on the news. – It’s been identified that in the exam, that was performed by General Directorate of Security on March 12, 2012 to meet the deficit of intermediate level of chief officers and taken by more than 50 thousand police officers, it’s been cheated. 68 of those winners were related and 485 of those who were the strongest personnel that the Congregation has in the organization, the Intelligence and Anti-smuggling units, Prime Ministry Directorate of Protection, and Principal Clerk of the Ministry, have scored between 85-90. It is also emerged that the winners of 2011 exam have answered correctly the 19 questions that were already erroneous by the Court. The Congregation was picking its members from the police academy students in the 1980’s, while they have been directly placing their own members into the Police Organization by plagiarizing the exam questions during the AKP government. During the examinations, the AKP government preferred to ignore these claims that were subject of the complaint and reported on the news as well. Only after the investigations on the corruption charges on December 17/25 2013 that the Congregation has targeted AKP with, the AKP government opened judiciary and administrative investigations on the examinations. So far this is the summary of the iceberg’s tip including the military and judicial organizations who fired their guns towards their own people with the coup attempt, the Police Organization and MIT (National Intelligence Agency – NIA)’s situation and, AKP government’s responsibility. There is one more anecdote that I would like to evoke. Gulen Congregation’s most powerful time was 2011. The members of AKP government, the majority of the media, and the vast majority of the members of the judiciary who are imprisoning everybody to prove that they are enemies with FETÖ, were afraid to mention neither the name Fethullah Gulen nor the Congregation. They obeyed the government powerful force, the Congregation, for their own benefits like they obey Recep Tayyip Erdogan and AKP now. I was arrested at that time as well due to Congregation conspiracy and the reason for that was also a professional activity as it is now. I was working on a book that was intended to investigate the Congregation’s police and judicial organized gangs during the Ergenekon investigation and its role in the case. The name of the book was «Imamin Ordusu” (“Imam’s Army») at that time, when everyone was afraid of the Congregation, being allegiant, and could not even mention its name. Yes, history is on our side once again. So you will not be able to create an illegal organization neither in the Cumhuriyet Newspaper or terrorists from us. As it states at the beginning of this text «The Indictment» that prepares the legal cover of this political operation does not legalize the shame that must be treated as trash. Just as some people who have their roles as judges and prosecutors before and after this political operation did not make themselves juriste. This operation directed at us is nothing but a persecution aimed at the freedoms of thought and expression and the freedom of press; and some members of the judiciary undertook the task of being the lynch mob of this persecution. In developed democracies, judiciary operates according to the international norms of law. It is a regulating power responsible for the establishment of justice; but in Turkey, some members of the judiciary themselves have become the grave diggers for justice. It is not surprising that in a country where dictatorship-aspiring people who are after the institutionalization of a system not bound by the regulations of democracy, to find a judiciary suffering in a political and intellectual destitution. If you take away rights, justice, conscience and merit from judiciary, what remains is the current status of the Turkish judiciary. We know perfectly well from our experiences that the summons of humanity for rights, justice, legality do not reach you. Therefore, I will not have a request from you. I would only like to tell you that the robes that surround you like a protective armor, are made of human lives and freedoms. The organization that you are looking for in Cumhuriyet Newspaper, is ruling the country under the disguise of a political party. The media that has become “his master’s voice” is serving the lies of this organization of vice as the truth to the public. They cover up the crimes and perform the task of proliferating the vice and making it banal. That is, spreading the Organization’s propaganda. Because, a well known truth is once again in front of us: Crime is the most potent adhesive in the world. It is this adhesive that binds the political power, bureaucracy, judiciary, plundering capital and the media that has become “his master’s voice”. Those who think that this dirty system, this crime dynasty will last forever are wrong. Like all the dictatorships that darken the pages of history, those who toil to progress with the insatiable hunger of their hates and ambitions, always prepare their own ends. When they arrive at their own hells the roads of which they themselves paved, there will be nothing left of their glorious arrogance and mind boggling condescension. – Despite the enemies of democracy, there are those who fight for a sustainable and far-reaching democracy. – Despite those who ​slaughter justice, there are those who defend the supremacy of law. – Despite those who glorify war and death to perpetuate their profits, there are those who struggle to make peace and life essential. – Despite the child murderers and protectors of paedophiles, there are those who work to make the dreams of children realities. – And despite those who want to strangle the truth, there are those who still want to be a journalist. This is all I want to say to an operation that wants to criminalize my journalistic activities. This is not a statement for my defence, because I consider doing so as an insult to journalism and to the ethical values of my profession. Because journalism is not a crime. Criminalization of journalistic activities is a common feature of ​totalitarian regimes. My experience shows that because of my journalistic activities I have managed to become the offender of the judiciary of every government and of every period. I am proud of this inheritance I will be leaving to my daughter. I know this government and its judiciary also has some issues with me. Because I am trying to practice journalism. Today, I am practicing journalism depending on the power of the truth, not depending on the power of the government or other power centres as it is broadly practiced in Turkey. Because practicing journalism under the regimes that are not closely associated with democracy and gradually becoming more totalitarian, means crossing the line. And journalism cannot be practiced by toeing the line and you cannot call it journalism if it is done toeing the line. If you write and talk by permission, you will be crushed under the weight of your inaptness. For this reason, what I am going to say is that I was a journalist yesterday. I am a journalist today. And I will continue practicing journalism tomorrow. That means the irreconcilable contradiction between us and those who want to strangle the truth will never end. In these dark days what we need is not the further loss of the truth. More than anything we need more truth. Therefore, I will continue to respect truth more than myself and continue to refuse being one of the conformists that deny the truth. For this , it is obvious that a price must be paid. But do not think that this scares us. Neither I nor the “journalists on the outside” that I am proud to be friends with, are not afraid of you whomever you might be. Because we know that what scares the tyrants most is courage. And the tyrants should know that no cruelty can prevent the progress of history. Down with tyranny, long live freedom. 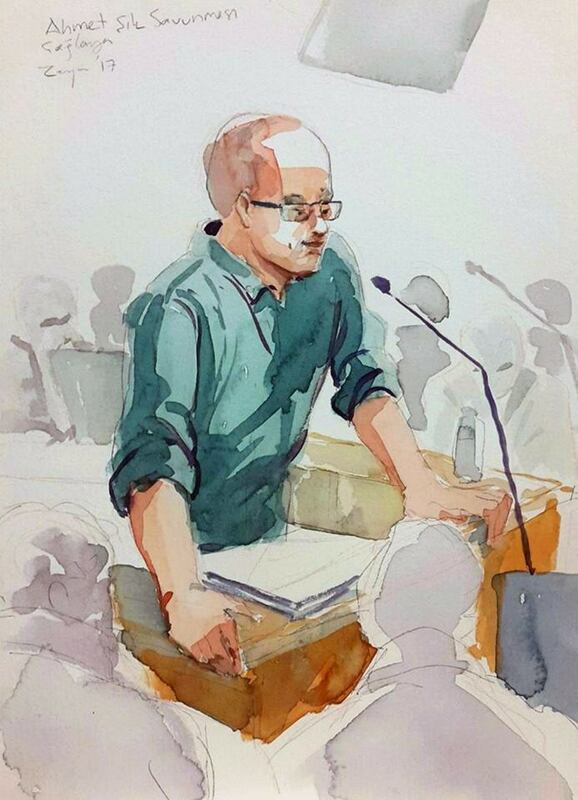 Translation by the Solidarity Group for the Freedom of Ahmet şık.